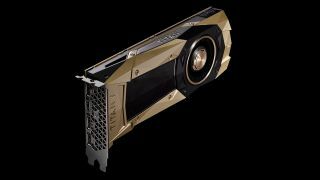 Nvidia unleashed a new most powerful GPU in the world at the end of last week, and now the Nvidia Titan V has been benchmarked in terms of its GPU mining abilities. The good folks at BitsBeTrippin conducted mining tests on the Titan V in a rig powered by a 16-core Ryzen Threadripper 1950X in an Asus ROG Zenith Extreme motherboard with 64GB of DDR4 memory, with a 1300W EVGA Supernova G2 power supply. CPU liquid cooling was supplied by a Corsair H110i. So how did Nvidia’s new graphics card with 110 teraflops of computing power perform when it came to mining? When overclocked, mining Ethereum it managed 77 MH/s while drawing 237W of power. Without any overclocking, straight out of the box the card achieved 70 MH/s. Check out BitsBeTrippin's video below for further performance results. That’s a pretty impressive performance, and roughly twice as fast as AMD’s Radeon RX Vega 64. However, the obvious rub is that the Titan V will set you back $2,999 or £2,700, compared to the Vega 64 which can be had for around $650 or £550 online at the time of writing. So the figures obviously don’t stack up in terms of relative value-for-money, but of course the Titan V is designed for AI and deep learning applications, and aimed at scientific researchers, not cryptocurrency miners (or indeed gamers). But remember, this is the first ‘consumer-grade’ card (yes, despite the price and target audience, it’s officially a consumer model because this is the Titan brand, not Tesla) to use Nvidia’s next-gen Volta tech. So this potentially bodes well for the mining performance of the more affordable Volta models (i.e. the successor to the GTX 1080). Although that in itself may not be great news for gamers, if we see a situation where stock shortages are caused by miners buying the cards up. We suppose a lot will depend on how the mining world looks next year – it’s currently a thriving environment, in the midst of a massive boom, but an equally huge crash is likely to follow. AMD has even indicated that it expects demand for GPUs used in cryptocurrency mining to fall as we head into 2018. Nvidia’s Titan V boasts 5,120 CUDA cores, a base clock of 1200MHz and boost clock of 1455MHz, with 12GB of HBM2 memory.